We get calls and emails all the time regarding how to block sound through walls, ceilings, floors, and windows, yet it surprises me how often doors tend to get overlooked. Soundproofing a door with door seals is an important aspect to soundproofing a room. You can add all the layers of mass-loaded vinyl and gypsum to your wall that you want. However, if you have even a 1% gap opening when the door is closed, you are losing a substantial amount of the sound-blocking capability. Yes, that’s right, a 1% gap opening can reduce door soundproofing effectiveness by 50%. Below are some proven methods for soundproofing a door assembly using door seals. Door seals kits can be a very effective means of stopping sound from getting through a door. 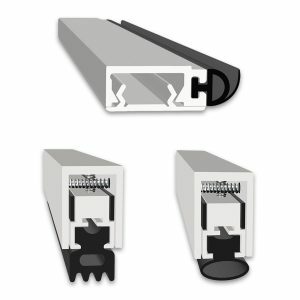 For a standard door, there are basically three parts that are needed. The door must be sealed on all four sides. A kit includes automatic door bottoms and neoprene door jamb and a threshold to engage the door bottom..
For standard-sized (3’0″ x 7’0″) doors we make a door seal kit that gives you all the necessary parts above that are pre-cut and ready to install. 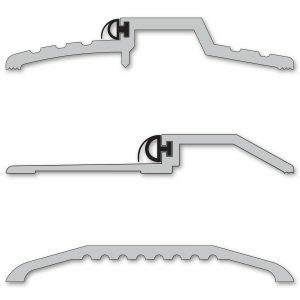 In addition to the parts referenced above, Astragal Seals can be used in the case of a double-door setup where you need to seal up the area where the two doors meet in the middle. These seals are available for double doors with two active leafs or one active leaf. One type of door that cannot be sealed well is a pocket door. Because of the way this type of door operates, it is next to impossible to seal efficiently. 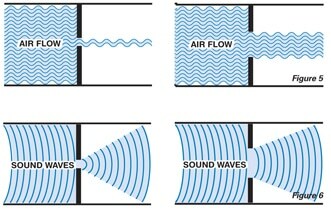 A pocket door is not recommended for an application where sound transmission is a priority. 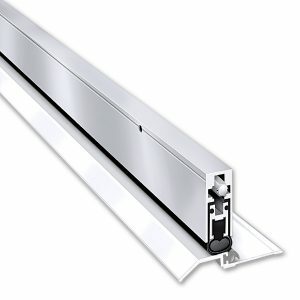 Our automatic door bottom / door sweeps utilize a concealed flat spring mechanism. This activates when the door is closed, lowering a neoprene seal insert against the floor or saddle. An Automatic Door Bottom can be attached to the bottom of the door to seal off the bottom edge. The advantage of an automatic door bottom over the typical door sweep that you can purchase from a building supply store is that the automatic door bottom is mechanical. Closing the door engages the plunger mechanism on the side which drops the seal to the floor. This gives you a nice tight seal whenever the door is closed. Door sweeps do not seal as well and can allow for small gap openings like those mentioned at the beginning of this post. Automatic door bottoms are available in surface-mount, semi-mortised, and fully mortised versions. Choose the look that best matches your application. This acoustical seal features our unique compress-o-matic design with a sound absorbing neoprene rubber gasket that compresses to form a tight seal as the door is closed. the Jamb seals attach to the sides and top of the door jamb. 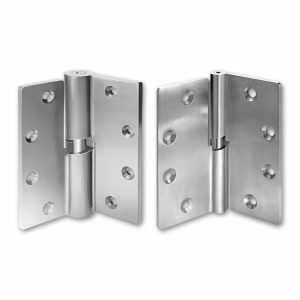 These are available in versions that either attach to existing door jambs or door frame. Acoustical door astragals are designed to effectively seal off the air gaps that create sound leaks where the doors meet. These acoustical door thresholds, commonly called saddles, feature a neoprene bulb fitted with a protruding rubber finger. This helps to correct any misalignment in the door as it is closed. In most cases you will want to use a good quality Threshold in conjunction with the automatic door bottom. This way the door bottom has a solid surface to seal onto. If the area the door bottom is sealing to is a hard surface like concrete or tile, you may be able to get by without one. If it is carpet you are definitely going to want a threshold and even in the case of hard flooring substrates mentioned previously, a threshold is still recommended for the best results. 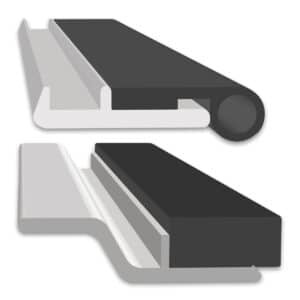 Like the door bottoms, thresholds can be made in a number of different ways; some are simple and flat while others can be taller and have seals of their own to create a double seal when used in conjunction with the automatic door bottom. 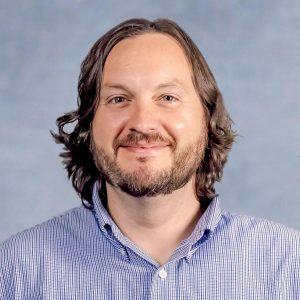 The former are typically used in high traffic areas or when ADA certification is needed, while the latter are typically used in applications involving high noise levels like recording studios, server rooms, or industrial applications. The can lifting action greatly improves the sealing characteristics along the door perimeter, lifting and lowering the door with the swing. Click below to see videos about door seals. Thank you visiting AcousticalSolutions.com! I received the comment you submitted on my blog post and wanted to respond to you directly. The main difference you are going to find between weather-stripping vs. the acoustical seals we carry are that our materials are actually tested to block sound. For instance, the model # 485 & 475 jamb seals are tested to achieve up to an STC 47 in door assemblies meeting this criteria and the model # 170 & 770 jamb seals are tested to achieve up to an STC 55 in door assemblies meeting that criteria. In most circumstances you would hire a general contractor or if your apartment building has a maintenance person, they would be the one to install this type of material for you. If you rent your apartment you will want to check with your landlord that it is okay to make modifications. Even though doors seals can be removed, installation still requires that holes are drilled into the door jamb and door. 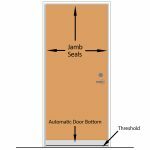 Pricing for door seal kits is provided on the product page. Where can I buy one of these kits and do you ship to Canada? Thank you for contacting Acoustical Solutions. At this time, our web store is not setup for orders shipping into Canada. An order may be placed by phone or over email. There are a few different models to chose from, with the most popular being the 485-2. Please note that these kits are sized for a standard, 3’0″ x 7’0″ door size. Be sure to accurately measure the door opening prior to ordering. If your door is not a 3’0″ x 7’0″ door size, we can customize a door seal kit solution for you. It would be tailored to your specific needs and have a slightly longer lead time. If you would like a quote on the kit or a custom option, please provide me with your requirements and shipping details. Please let us know if you have any other questions or would like to discuss this further. Do your door seal kits, door bottoms, etc meet code if installed on fire doors in my Ontario home. Hello Michael, thank you for contacting Acoustical Solutions. Whether or not our door seals would meet fire code is going to be dependent on the particular code in your locality which varies from state to state, and in your case may be very different since you are in Canada and not the United States where we are based. My recommendation would be to contact your local fire marshal and show them the materials you are considering to purchase to see if they tell you if they meet your local code or not.